Hi everyone, Nikki here from A2A - Addicted to Art and I have the pleasure of hosting our latest challenge. The theme for the next fortnight is to 'Use every stamp in a set’. It sounds quite challenging but although we would like to see each stamp in a particular set used, it could be a full or partial image of each of them. The Creative Guides have made some amazing pieces to provide some inspiration. Do pop over to our personal blogs where you will find more detail on each of the projects. 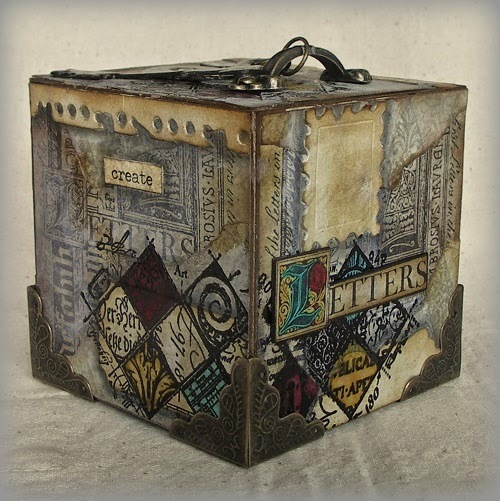 Of course there is plenty more inspiration to be found on Tim Holtz’s blog too! Our lovely sponsors, Country View Crafts are, once again, offering a £10 gift voucher to spend, to one winner who will be chosen by the team. I have used one of Tim's Visual Artistry collections to make this card, there are 6 stamps in the set. I have incorporated lots of layering ( I love how Tim works with layers), distressing and some crackle paint to embellish. Based upon one of Tim's earliest stamp sets, Fancy flourish, my card is almost a total homage to him! His dies, inks, remnant rubs and other Idea-ology have all been used together with his stamps and techniques. Full details of what and how are on my own blog. 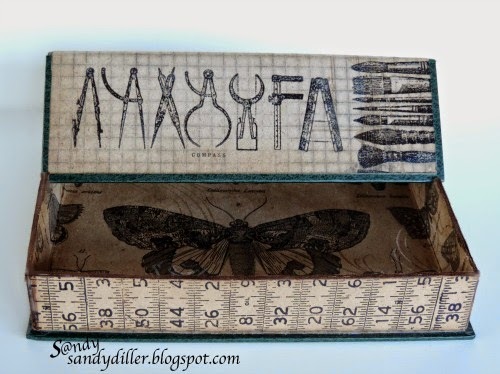 Using Tim's Artful Tools Stamp Set - I made a small tool box to keep on my work table. No problem making a Tim inspired project when these stamps, papers and inks make everything so easy. Hopefully I will be able to spend more time working and less time looking for things. To see how I made it - stop by my blog. I thought this challenge was a great chance to go back to my first love and just plain stamp! I used the Urban Tapestry set and of course there had to be Distress Inks involved. There's some glossy embossing that you can't see here - you'll have to pop over to Words and Pictures for the full effect. 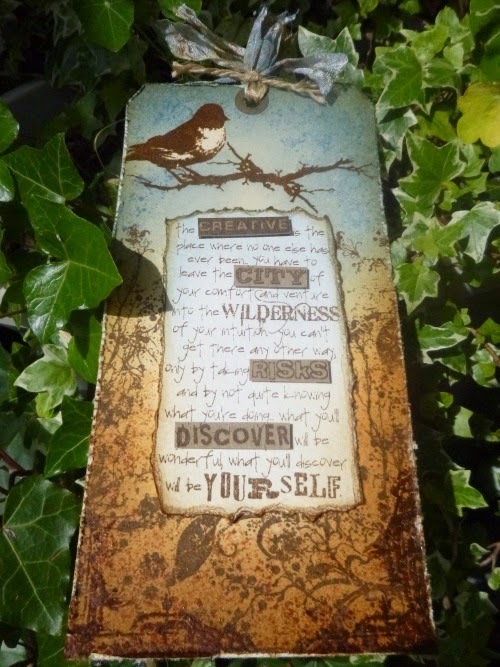 and as you can see I had a great time using the stamps, stencils, Idea-ology and TH Sizzix dies as well as some splatting here and there with Distress Stains. You can view the process over on my blog by clicking my name above. I'm loving using Artist Trading Blocks as boxes for storage purposes in my craft room (what's that saying, "Have nothing in your house that you do not know to be useful, or believe to be beautiful." William Morris) There's a bit of a collection building now and this is the latest, using every stamp from the SA 'Classics #3' set. There are six sides to this so head on over to my blog and take a look. 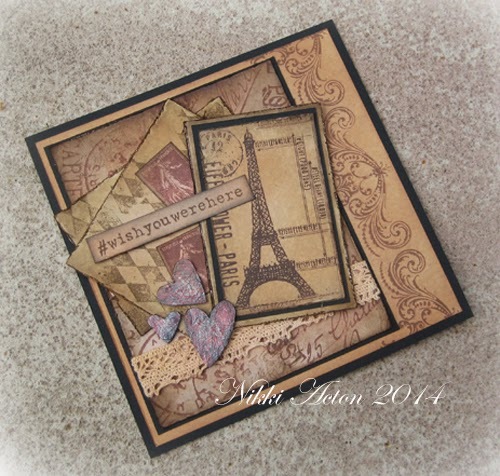 I loved this challenge as it really made me think about how I use my stamps. I chose to use Tim's Paris Memoir set and made a hanging. I added some stamps from his Papillon set and used texture fades and dies too, but for the background I used Fresco Finish paints. 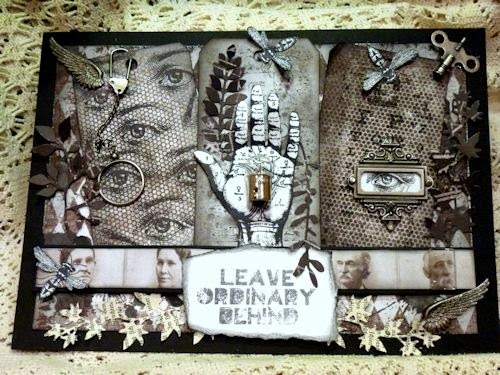 Some fabulous projects to inspire you and we look forward to seeing how you use Every Stamp in a Set. 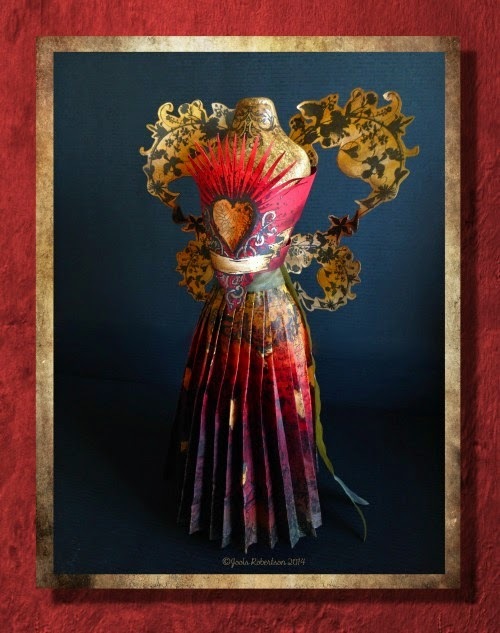 Please remember it does not need to be a Tim Holtz set but please do tell us how you have been inspired by Tim in order to be eligible to win. Just been to visit all of you lovely CG ladies and I am so impressed. Wonderful inspiration! Hugs! Totally amazing projects. Hope to manage to join in this time. What marvelous inspiration from the Creative Guides! Now to pick one of my Tim sets to be inspired by for my project! So wonderful samples from the DT. The collection has closed, but I did want to let you know I have a different version of the same card (same link) - easier to view. Sorry about that terrible image - without internet access in our motor home it was harder to take care of this. I wish I had the time to "case" each and every one of your examples - what inspiration.